MyHealthEd Inc., a nonprofit organization co-led by two students in the health behavior department at the UNC Gillings School of Global Public Health, has won the $25,000 Aetna Foundation Prize for Health Equity Innovation. 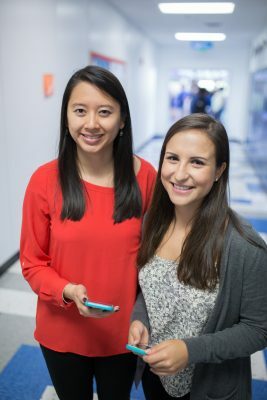 Liz Chen, MPH, and Cristina Leos, MSPH, both doctoral students of health behavior, are two of the three co-founders of MyHealthEd Inc., which focuses on improving health education for youth through the use of technology. Vichi Jagannathan, a Master of Business Administration candidate at Yale University’s School of Management, is the third co-founder. The team received the Prize for Health Equity Innovation on April 21 at StartUp Yale 17. They pitched their Real Talk mobile app for middle school students and their efforts were named the best student-led venture focused on developing a technology solution to address a health disparity. Chen, Leos and Jagannathan also took home a $250 Audience Choice Award. 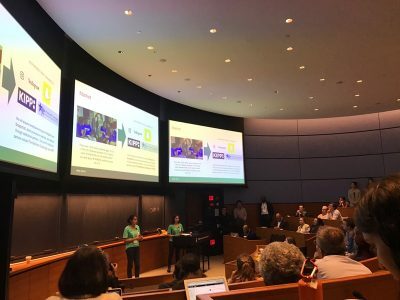 Cristina Leos (R) and Vichi Jagannathan (both in green shirts) present on the Real Talk app at StartUp Yale 17. Along with the cash prizes, the MyHealthEd Inc. founders will receive legal and consulting services to assist in their future endeavors to disseminate health education through mobile technology. The Real Talk app is scheduled to be released in early 2018.